Did some foam art with Jazz last weekend. It was pretty easy and she could do it quite independently. The only challenge was deciding which piece of foam to lay on first. I was so excited about starting her on, I told her to stick the characters first. I was wrong! The background, brown ground and grass were suppose to go on first. Good thing we could remove and stick again. This peeling and sticking took quite some time, she patiently completed the job within 30mins. I bought 4 such foam art from popular during their recent book fair. Such art can help train cognitive thinking, mobile skill and patience! It's always a challenge to keep Jare out of our crafty sessions. He loves grabbing whatever stuffs we are working on. I kept him occupied with a piece of paper and some colour pencils. He completed an art work too! I love the piece he drew, simply can't stop admiring it. Gonna get it up to the wall soon! Run out of blu tack at the moment. He started doodling with a single colour, blue. After which, I thought that the piece was monotonous. I gave him different colours between his doodles. Not too bad of a 15 month-er's work. 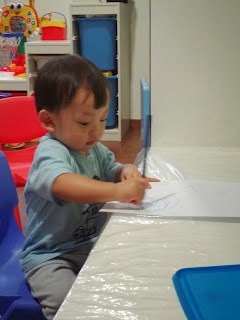 Most glad that paper and colour pencils kept him occupied and mess free.